Powers: None. Penny is a skilled nurse and has a large amount of medical experience. 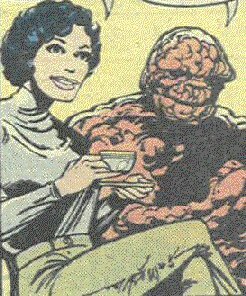 History: (Fantastic Four I#238) - Penny was a student nurse when she met the much older Dr. Jacob Grimm, who was convalescing from a bad auto accident, which had killed his wife and left him partially crippled. After he recovered, she became his student, and eventually his wife...An' she's been the Thing's favorite aunt ever since! Shortly before the start of the modern era (Marvel's modern era, the FF's rocket trip), Jake and Penny left New York and set up a practice in Benson, a small town in Arizona. More recently several people were found in Benson, frightened to death. 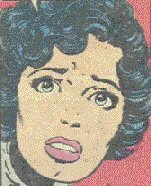 At a loss to explain these occurrences, Jake sent Penny to Manhattan to request the help of the Scooby Doo gang...I mean the FANTASTIC FOUR... in uncovering this mystery. The FF found a group of goblin-like mystic creatures that forced the entire town to confront the force of the dark side that dwells within them all. Some of the people perished, and most of the rest of the citizens fled the town. Penny and Jake and 26 others apparently passed the test and decided to stay in Benson. (Thing II#8) - Jacob & Petunia attended Ben's Bar Mitzvah, celebrating 13 years since he had been transformed into the Thing. Comments: Mentioned by Stan Lee, re-invented by John Byrne. Aunt Petunia was first mentioned by Ben back in the early FF days, and was sort of a running gag. Ben's comments made it appear that she was much, much older, probably in her seventies or eighties. When she was first seen, everyone was surprised by how young she was, and Ben gave no explanation for why he had stretched the truth. Wendy's friends have an entry, but it doesn't give you much more to go on.